Shebdon Embankment to Plardiwick Bridge via the Grub Street Cutting and Norbury Junction #narrowboat #England – The Diesel-Electric Elephant Company. Aye, well. ‘Appen as reckon as mebbe. Yesterday’s cruising saw the Cardinal and I past the opening salvo of the CaRT planned winter maintenance stoppages and into the vi-cin-it-ee of Gnosall. The day dawned bright and not disastrously breezy, and Her Majesty’s Meteorological Offices promised (and delivered) freezing conditions for yesterday’s tomorrow, today’s today. After my customary caffetierre of chicory coffee I put on some trousers, loosed the Cardinal’s ropes and set us off. Five and a half miles in total, half of that necessarily very slowly since half of the distance is lined with residential and long-term moorings. We met about two hundred chaps while traversing the Grub Street Cutting – there was some sort of “war on the terror of fresh-water fish” being waged by that many anglers. We may all sleep more soundly in our beds knowing that two or three dozen minnows have been hooked out, weighed, lectured on the importance of being both Earnest and of not threatening human society, and then released back into the murky waters of the Shropshire Union Canal. Millions of anglers, all spaced out and all intent on snagging themselves a shark or a bandersnatch or a behemoth or whatever inhabits these waters. The usual percentage of the anglers were happy and sociable, the remainder all had some sort of secret spare fishing rod stuck up their Wrecked ’em? Well, it certainly hadn’t done them any good by the expressions on their faces. We met a day-hire boat coming in the opposite direction. As soon as they got within hailing range they were asking for advice – the boat hire company hadn’t told them so much as on which side they ought to pass… (btw., the rule is to pass on the right, unless by agreement during manoeuvring or some such). Yes, that is a very short telegraph pole up there in the air, in the middle of the bridge. Someone’s bright idea. The Cardinal’s slight list to port is a behaviour that he always seems to adopt when we are in especial shallows. Between the lack of water and the effects of leaves wrapping around the prop, making progress was a bit akin to boating up-hill. Norbury Junction, and services. Hmm. Yes. TBH, it was all a bit “Stackton Tressle” for my way of thinking, with boats a-stored left, right and centre, and an overly-cheery shop/cafe/whatever sporting far too many outside tables with umbrellas (and all up, even at the end of October). I could have grabbed another couple of bags of coal there and a splash of diesel, but my inner-mooch just wouldn’t let me. I listened, and didn’t. I shall probably regret that later, but hey ho. The “junction” of Norbury Junction is no longer. This was once the outlet for the Shrewsbury, Newport and Trent branches to the west, but they’ve now disappeared into the mists of neglect. Only the few yards under the bridge is still used, and at that as a rubbish dump. I mean, as a storage yard. Um – officially as a “dock”. A defunct junction. The Cardinal and I slipped under the bridge to the top right of frame, and this photo was taken from his stern deck. The CaRT portion of the establishment looks to my eye to have once been a pumping house of some sort, with that tall chimney. Norbury again, looks like some sort of old Pumping Station to me, with that tall chimney. It’s all looking a bit “Where’s my caretaker gone? Has he died?” now, like so many things, but they have managed to bung up a banner sporting the new logo. Doubtless in a year or two it will be closed and sold off lock, stock and barrel as a “des res” to some City banker for tuppence ha’penny and “other valuable considerations”. Those considerations likely being kinship and/or mutual membership of the Silver Spoon Club. That’s the way we’ve let the world come to work, these days. There were some nifty-looking “48-hour” moorings on the out-side of Norbury, but the place just didn’t have good vibes, and I saw a serious, serious four-dog/two-owner fight on the towpath, and we mooched on. I have a black belt in the noble martial art of Ifpossiblenotbeingwheretroubleis. We traversed the Shelmore Embankment soon afterwards. This was what was known to the canal builders as “a bit of a bugger”, since it kept collapsing time and again as they moved the millions of tons of earth (by shovel) to raise the canal to its impressive height above the countryside. It was so much of a problem that it was the last part of the canal to be finished, years late, in about 1835 and well after Thomas Telford’s death by fatal dying. Towards Gnosall I began looking for moorings again, and plumped for the first such that I saw. They are a bit “dingly dell”, but have proven so far to be worth their salt. Dingly dell moorings, near Plardiwick Bridge, Gnosall. Somehow, don’t ask me how, there is a whole bar of the 4G interwifinet signal here. How it is getting over those banks and through the trees I do not know, but it is. Luxury, pure luxury! That is Plardiwick Bridge behind the Cardinal, running, you will be surprised to learn, into or out of the neighbourhood of Plardiwick depending upon your choice of direction. Gnosall lies a few hundred yards ahead. 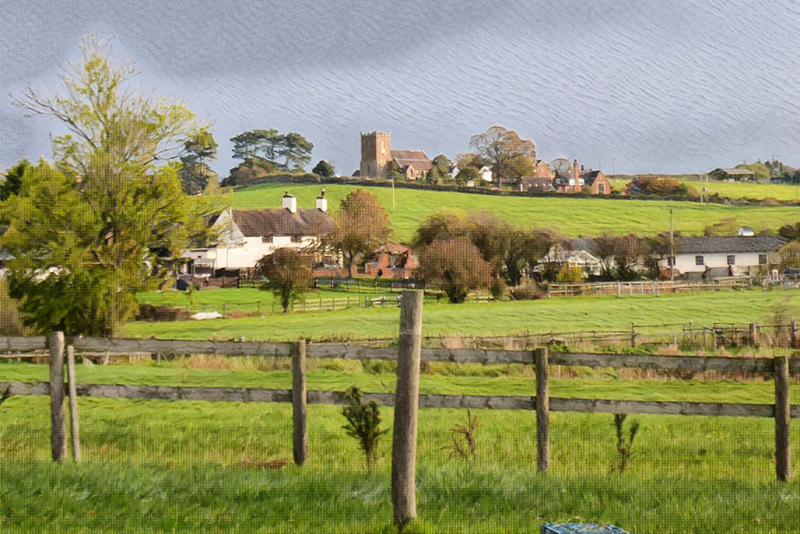 It would be unkind to describe Gnosall as a “one horse town”, and it is anyway no longer true, although you can still see the hoof-prints made by the horse as it left for pastures new. Those explorations can wait a day or two though. These dingly-dell moorings may be doing my poor solar panels a power of no good at all, being so heavily shaded, but they are fine enough, and I shall enjoy going nowhere fast for a short while. Mr Stove is beginning to realise that I am quite serious when I ask him for heat, and that I am not just feeding him choice items of coal in order to fatten him up, but as energy for the fight. This morning’s fog and frost has cleared, but I suspect that it is only out for the day and will return early this evening. While we’re here I can plan the next chunk of our trip. I might nip into one of the two pubs on the canal, just for a swift pint. I could drink a toast to Gnosall’s long-lost one horse. All those leaves and frosty mornings leading us into Christmas. You’ll soon have to order your Christmas brussel! Edit: MOST to MOSTLY. I wish we could edit comments. It’s MOST very picturesque. I love the first picture in particular. Very English Feeling, said the Naive American. All this energetic moving is going to get exhausting. I hope you pick up a bottle of something to strengthen you in the cold days ahead.